When the second World Trade Center building collapsed to the ground on September 11th, 2002, it marked the end of what knew to be the picture perfect New York skyline. Built over the span of a decade and completed in 1977, the towers symbolized a skyline of power and beauty. As the towers came falling to the ground, the question asked by many was just how these giants of architecture, built to withstand nearly anything, fell after the impact of a jet liner. 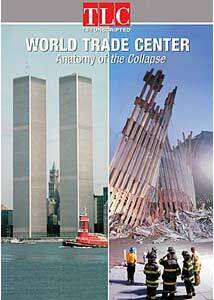 While no one will ever have the definitive answer, World Trade Center: Anatomy of the Collapse does its best to help explain. Covering nearly every aspect of both the construction and subsequent destruction of the towers, this documentary, produced for the cable station TLC, does a nice job of explaining why and how the towers failed. Featuring interviews with the original architects as well as structural engineers, the documentary begins with a strikingly haunting series of images that shows the once mighty buildings reduced to a pile of steel and rubble, ultimately suggesting how this happened and could have been avoided. Combined with w wealth of knowledge of structural design, there are terrifically detailed CGI renderings of the inner structure of the buildings, and this documentary offers a closer look than other programs I have seen. What makes World Trade Center: Anatomy of the Collapse a standout from the numerous other documentaries about the building and terrorist attacks is that the filmmakers thankfully take the viewer one step further into the creation and subsequent opening of the Center. The documentary also takes time to focus on the first terrorist attack on the plaza in the early 1990s and shows what happened when a truck, packed with enough explosives to potentially topple one building into the other. Another portion of the program deals with the numerous obstacles that were cleared when the construction of the towers began and how designers and engineers built the structures to resist high winds by, for all intents and purposes, essentially stacking one structure on top of an other to create a durable skyscraper. There are moments of World Trade Center: Anatomy of the Collapse that will prove difficult to watch for some, including numerous scenes showing the now famous impact of the commuter planes. For those though who are fascinated with how the towers failed to hold up, this film is both an educational and emotional look into these architectural marvels. Image Transfer Review: Presented in a full-frame transfer the image quality of World Trade Center: Anatomy of the Collapse is, at times, a bit soft. Sharpness and detail in the sequences set in the present day look as though they have a sort of hazy appearance, though for the most part the quality is acceptable. Numerous sequences featuring archival footage look fine; the age of the prints used does show from time to time. Overall the transfer is adequate given the material. Audio Transfer Review: The Dolby Surround mix is fine given the material as dialogue sounds rich and clear in both the interviews and narration. A good mix given the subject matter. Extras Review: Eight chapter stops are accessible via static themed menu pages. I would have enjoyed some special features geared toward the towers such as blueprints or even a seperate section devoted to the history of the Twin Towers. World Trade Center: Anatomy of the Collapse can be found for a low price at most retail stores and for those who are so inclined a purchase would be a safe bet. I enjoyed the disc and it stands as one of the few educational programs that will get a repeated spin in my DVD player.